the wonderful world of peter d. cole. | owl's house london. the wonderful world of peter d. cole. Peter D. Cole is known for his wonderfully exuberant and playful works. I discovered him on Instagram, his works colour-bright set against their pure, white background. 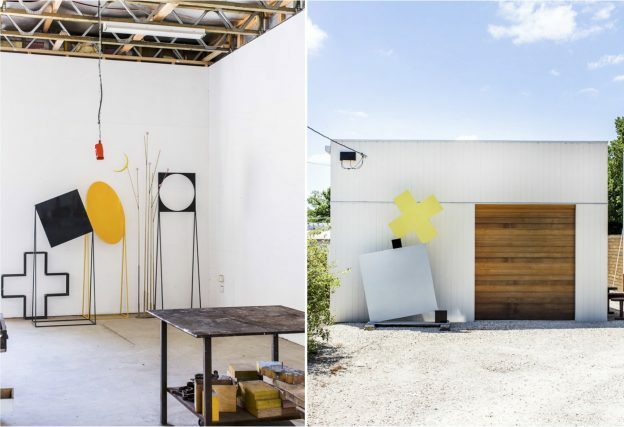 His abstract, watercolour paintings and bold, minimal sculptures are firmly rooted in the landscape of his native Australia; a simple vocabulary of singular elements floating on a sea of colour. Forms are broken down to represent the most fundamental elements of sky, earth, sun and moon, picked out in primary reds, vivid yellows, intense blues and other clear, saturated hues. Displaying the modernist language of his art school training in the mid 1960s, he cites Miro, Calder and González as influences, along with the Constructivists Moholy Nagy and El Lissitzky. Specific works too – Giacometti’s The Palace at 4am and Le Corbusier’s Ronchamp – have informed his sculptural pieces, styled out of powder-coated steel, aluminium, marble and brass. 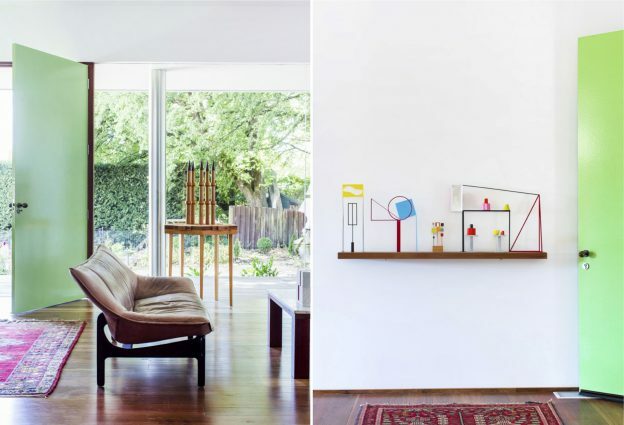 Peter works from a purpose built studio adjoining his home in country Victoria, having designed both studio and house himself. Influenced by Japanese houses and the natural desire to capture the afternoon breeze, the main house sits on an elevated platform with a simple set of stairs leading to the entrance. 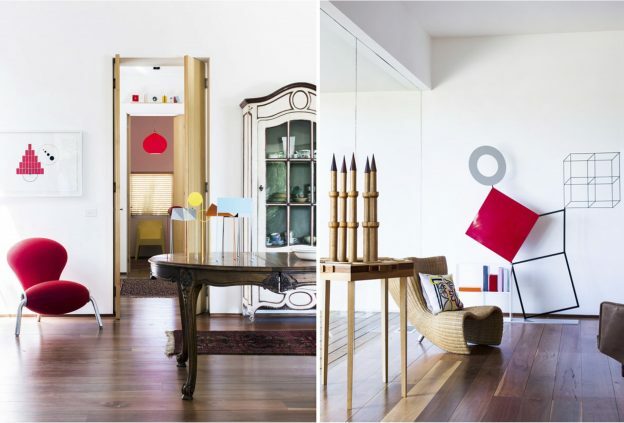 The high ceilinged, white walled, light filled rooms offer perfect, gallery-style spaces in which to display his work. The palette of materials is thus restrained, starting with floors of richly polished timber and walls of glass, creating an almost invisible boundary with the outdoors. Extraneous elements have been removed – doors are recessed into wall thicknesses or simply framed in wood; junctions abut each other crisply. Elements of singular colour counterbalance the bold hues of Peter’s sculptures. Door handles and drawer pulls were designed and made by the artist, along with many of the light fittings. 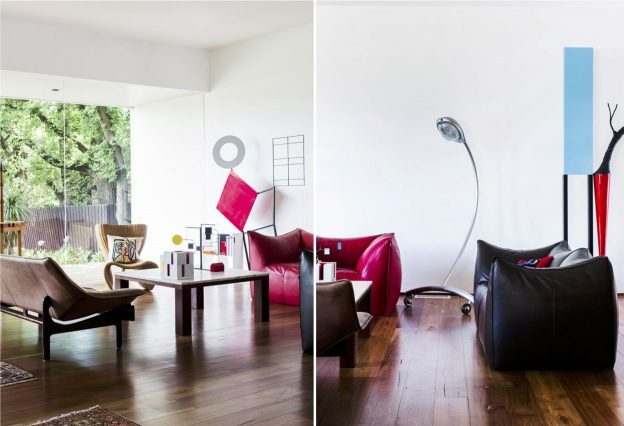 Furniture is a mix of antique and modern. Marc Newson’s idiosyncratic pieces are stand-outs, from the fabulous Wicker and Embryo chairs to the Super Guppy floor lamp, all of which sit comfortably amongst Peter’s bold, architectural forms. Photographs: Sean Fennessy via Peter D. Cole, with thanks. This entry was posted in in the gallery. 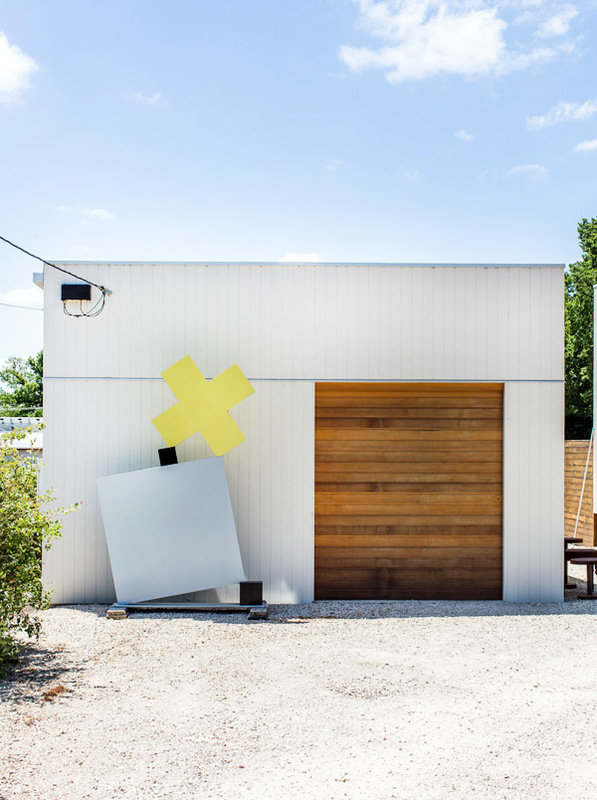 and tagged Alexander Calder, Le Corbusier, Marc Newson, Miro, Modernism, Peter D. Cole, The Japanese House on July 13, 2017 by owls house london..